A rare saxophonist who is comfortable playing baritone, tenor and soprano records an album that is, simply, beautiful. 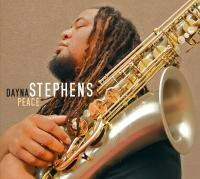 Dayna Stephens is a special saxophonist, a player with a lyrical bent that is lost in the flood of players who come out of the jazz schools able to play like virtuosos, machines, dazzlers. His latest recording, his fifth as a leader, aims straight at your heart, but it does so simply and without the least amount of schmaltz. It is just a very beautiful jazz record. One to keep listening to for a long time. This is a recording of standards, a few of which are played infrequently, nearly all played at ballad tempo or mid-tempo. The rhythm section accompanying Stephens is exceptional: the young and elegant guitarist Julian Lage, pianist Brad Mehldau and his frequent partner on bass, Larry Grenadier, and the elite percussion of Eric Harland. On these tracks, Stephens plays soprano, tenor, or baritone saxophone, and his soft touch on all three is remarkable. Though he can be a fiery player, Stephens caresses these tunes, he draws power from their beauty, he makes them just a little better than they normally are. For me, this recording is a bit of a reclamation project, as Stephens tackles some songs that, frankly, I had forgotten that I loved. When is the last time that you heard “The Good Life”? You know it if you’re in the vicinity of my age: “It's the good life, full of fun, seems to be the ideal / Yes, the good life lets you hide all the sadness you feel”. A Sinatra staple, it’s a song I would have thought too corny or old to really pierce my heart. But here it, with Stephen intoning the melody sadly and beautifully in his tenor’s low register, the lyrics coming through as clear as ever despite a lack of words. he is accompanied just by Grenadier and Lage, no drums, no piano, all this space around the melody that just makes you realize how good the song is at it’s core. The same goes for “I Left My Heart in San Francisco”, played here with no frills on baritone sax with just the piano trio. Like so many of the great jazz players active today, Stephens is from the Bay Area (specifically, the almost impossible fertile Berkeley High School), and he makes this song an anthem, perhaps. I detect no irony in how he lovingly moves across the chords in his solo, finding just the right notes on which to linger, returning to the melody before handing things over to Mehldau, who picks up the song’s penultimate phrase and spins it into a tension-filled contrast. Your skin shimmers a little hearing it. Brad Mehldau remains a pianist whose improvisations truly earn the moniker “spontaneous composition”. His solo, for example, on Jobim’s “Zingaro” is as good as this music gets. Not one phrase sounds like a stock lick. Mehldau seems to make time slow down even for the listener as he carefully places each note against the beat, building a line of melody that hunts around for feeling, rises, grows in tension, and seems to be a thing of its own, not just a set of notes that happen to “fit” the tune’s structure. On Horace Silver’s tender “Peace”, Mehldau plays a ballad solo that never gets soft. Lage also contributes to making Peace special. What a great idea to play Dave Brubeck’s classic “The Duke” without piano (Brubeck’s instrument). Stephens shares the melody statement with Lage, and the leader’s solo is perfectly complimented by the chemistry among Lage, Grenadier and Harland as a rhythm section. “The Duke” has never seemed to natural before, and Lage’s brief solo just upped the excitement. “Oblivion” is an Astor Piazzolla slow tango that needs his touch, but it’s his solo on Henry Mancini’s “Two for the Road” that really shines. The arrangement is savvy, with Harland laying out until Stephens’s tenor returns with that great, melancholy melody. Afterward, the leader and Lage trade fours — rare with a ballad — on the fade. Stephens himself kind of sneaks up you as a soloist. His melody statements on this record are remarkably slinky and stylish. “Moonglow”, a duet between baritone sax and acoustic bass, has Stephens move from melody to solo with élan. He is playful and rhythmically interesting as he improvises here, but it’s clear that he’s trying to keep the focus on the tunes. Dayna Stephens is not here to show off. Even on the song that tenor players have traditionally used for showing off, “Body and Soul”, Stephens plays it cool. First, he plays it on baritone, where his silky tone mostly avoids any barking gruffness. Second, when he departs from the melody, you always feel that he tethered to the song’s core — not just to the chord structure, that intellectual thing, but to its mood and purpose. Not all of Stephens’s music is burnished with heart like Peace. He is a versatile player, as his resume suggests. But neither is the latest release an outlier. Stephens has a knack for reinvigorating older tunes, as demonstrated by a recent set at The Jazz Gallery containing a rethinking of Coltrane’s “Impressions”. But on Peace the leader is at his most contemplative and warm, projecting a centeredness that I, for one, could use more of. Don’t bother resisting it — this kind of tradition is good for the soul.